Bw Helder is a contemporary created by Thom Niessink together with Alberto Romanos and published by Branding with Type which it comes in 3 widths (W1, W2, W3) each with 6 weights (from Thin to XBold). 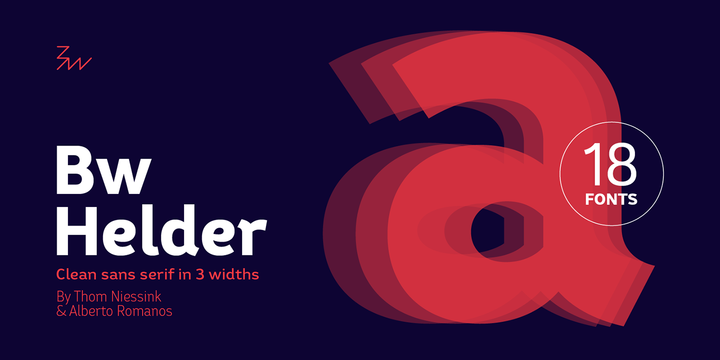 This clean and versatile font it merge well on any kind of project especialy in small sizes. Have fun! Price: starting from $22,50 for one font to $162,00 for all 18 fonts. A font description published on Tuesday, August 22nd, 2017 in Alberto Romanos, Branding with Type, Fonts, Thom Niessink by Alexandra that has 2,691 views.